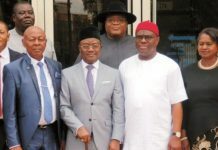 Rivers State Governor, Chief Nyesom Wike (middle), Chief Judge of Rivers State, Justice Adama Iyayi-Laminkara (2nd right), Attorney General of Rivers State, Emmanuel Aguma (SAN) (2nd left), during the governor’s inspection of State High Court Complex damaged by a faction of the APC loyal to Transportation Minister, Rotimi Amaechi , last Friday. Imo State Governor, Chief Rochas Okorocha, has said indebt probe of the missing result sheet of last week’s ward congress of the All Progressives Congress (APC) in his state was likely to unravel the monumental fraud that has been going on in the national leadership of the party. 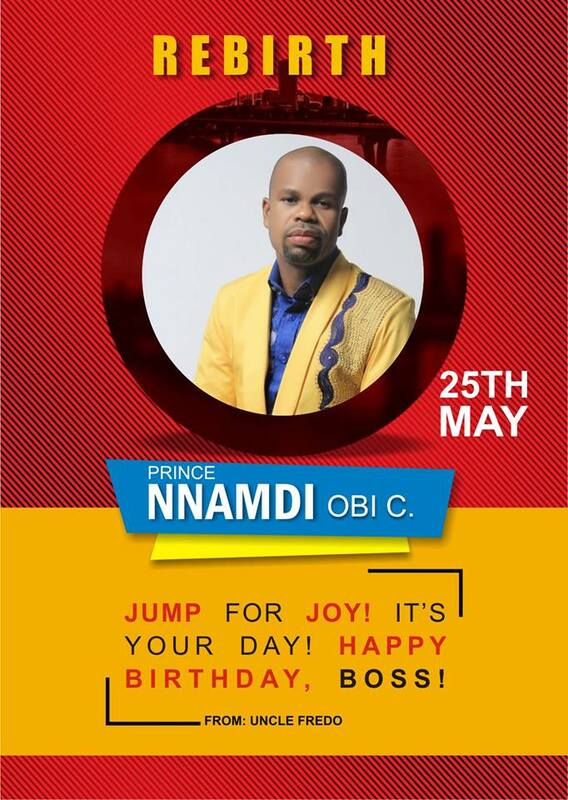 This was even as he explained that efforts at demystifying him in the politics of his state were being launched by the National Chairman of the party, Chief John Oyegun and his team in the National Working Committee of the ruling party. The reason, the national leadership led by Oyegun moved against him, he explained, was due to his staunch opposition against tenure elongation which was earlier adopted by the party in their favour. Addressing journalists in Abuja, yesterday, on the outcome of last week’s ward congress in his state, which he insisted never held, said the disposition of the Oyegun-led national leadership of APC on Imo ward congress was glaring that he was on a vendetta mission against him for insisting on conduct of congress contrary to tenure elongation which he was to benefit. Okorocha prayed the appropriate authorities to go all out to unravel the circumstances surrounding the missing result sheet even as he hailed the police for a major breakthrough into the situation following yesterday’s arrest of four persons in an Abuja hotel with some of the result sheet. 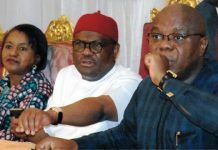 But the Imo State helmsman said a deeper investigation into the case was likely going to unravel fraud that the national leadership has perpetuated even as he threatened to leak the unheard secrets of his sacked appointees who have now queued up against him in opposition camp in the state. He pointedly accused Chief Oyegun of lying on the whereabouts of the missing ward result sheet to him, immediately after the purported congress in his state, asking him to start being upright in his dealings if he wanted the nation’s democratic history to have him in good book. Hear him:”I did asked the National Chairman, Chief John Oyegun, ‘that where is the result and the chairman did tell me categorically that he had received the result sheet and I asked him that who submitted the result because I’m aware that the police is looking for the result sheet and the SSS too is looking for the result sheet and if the result sheet has reached the party office, then who submitted it?’. “And I said that those who submitted the result sheet should tell the security agencies how they conducted the congress and got the result sheet only for us to hear today that no result is in the party’s office. “This means the party lied that they have gotten the result. Everything there looks funny, it looks like some kind of mischievous connivance of people trying to make up things, cook up stories and tell people that this is how I lie. “Once we are able to find the result, we will be very happy to know how they came about with that result sheet because as at 6pm on Saturday of the election, both the Organising Secretary of the party confessed that they couldn’t have the result sheet, the police Commissioner equally confirmed that there was no result sheet, the chairman of the panel confirmed that there was no result sheets,the SSS confirmed that there was no result sheet and the chairman of the party in Imo confirmed they could not see the sensitive material and therefore, there was no election. “So if the result sheet finally appeared in the party office, then it’s a very interesting story that the whole Nigerians need to see. “I think this will correct the issue of corruption in the internal democracy process in our party. It is unfortunate that men who were elected, respected men at that level will conscend to lying and cheating and violating the party’s principles. On why he believed the national leadership was hounding him, the Imo State governor said:”I spoke against elongation, that elongation is not good for our party when the national chairman of our party and some of his members believe that there should be elongation so that there would be no congress as provided by the party’s constitution. “ And I told them the danger if we do not conduct this Congress. I was a lonely voice in that matter until it became an issue that picked the interest of our party leaders and I supported my position. “ I was saying that if we do not conduct congress and we conduct primaries, those people that elect our governorship candidates in the primaries would have been illegal. “And that we might win election and somebody will just go to court to challenge the decision and they may go to court ad win because we were elected by those delegates. That was just my position and they said no, the Constitution allowes partial supremacy. He explained why the ruling party was having crisis at the moment, saying he forsaw it and warned but his warning was not taken serious by stakeholders of the party. Hear him:”I think the mistake that led to the whole issue is that we appointed a convention committee chairman who is the governor of Jigawa State and instead of him to conduct the congress and convention, the national chairman of our party and his team are the ones congress while the committee would conduct the convention, it’s not done that way. “That’s where we have problem now because most of the National Working Committee members have interest in this matter because they are conducting the congress for themselves, like what happened in Imo State when the National Organising Secretary is conducting congress elect delegates that will elect him to come back as National Organising Secretary, it’s not done that way. Regretting that the people he had at one point or the other raised not only politically but financially through appointments in his government had ganged up with opposition figures against him in Imo, Okorocha advised that they be careful else he would expose their misdeeds in office, the reasons he said they were fired. He continued:””For them to turn around to become a force, they have grown, I’m happy to see them grow but let them do the right things. Let them follow the right process and let them queue up and let the people vote them. “Most of them were sacked and there were reasons why they were sacked, it’s not for me to tell the world why they were sacked from my government at that particular time. But if they have constituted themselves into this kind of opposition, I would be glad to say so. But the most interesting thing now is that even the PDP elements have joined them because they know that this is the immediate problem, trying to collect power from Rochas is the collective resolution of all the political elite in the state. Meanwhile, the Peoples Democratic Party (PDP) has again chided the ruling All Progressives Congress (APC) saying since it assumption of power, the party has been engulfed in crises, capable of driving the nation to a state of lawlessness if not checked. The party said since its emergence, the APC and its leaders have engaged in actions aimed at instigating a breakdown of law and order among Nigerians, even in its fold as a party. A statement signed by the PDP National Publicity Secretary, Kola Ologbondiyan, yesterday, read: “APC has become a symbol and harbinger of malevolence, which by every indication, is on a sordid throttle of taking our nation to the long forgotten state of nature where only the mighty rules: the state of anarchy. “From its cannibalistic proclivities, the world can see why the APC and its insensitive federal government care less about the lives and welfare of Nigerians, resulting in the escalation of violence, bloodletting, mass killings, extra-judicial executions, persecution of citizens, abuse of human rights, constitutional violations, including invasion of the National Assembly as well as attack on federal lawmakers and judicial officers. 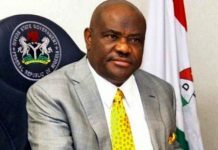 Similarly, the Rivers State Governor, Chief Nyesom Wike has stated that Nigeria was bleeding profusely and the only way to stop the bleeding was to vote out the All Progressives Congress-led Federal Government in 2019. Wike said that the current administration was allowing bloodletting to continue unhindered, a situation, he said, has made God angry with the country. 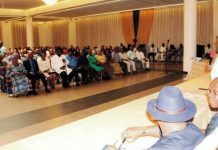 Speaking after he inaugurated gubernatorial liaison officers for the 23 local government areas and 319 wards of the state, last Friday, at Government House, Port Harcourt, Wike said it was incumbent on all Nigerians to work towards voting out the APC in 2019. Wike announced that the state government would also employ another 100, 000 gubernatorial liaison officers for all the polling units in the state. 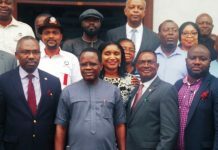 He said the gubernatorial liaison officers would serve as his direct representatives in all communities of the state for the purpose of generating quality information for good governance. The governor added that the liaison officers would also be saddled with the responsibility of propagating government policies in all communities. “The liaison officers will collate information. They should hold regular meetings with community leaders and other stakeholders”, he directed. 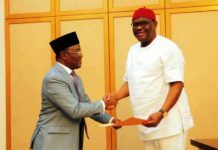 In his remarks, PDP National Vice Chairman, South-East, Mr Austin Umahi praised the governor for the worthy initiative to take governance to the people, adding that Wike would emerge victorious in 2019 because of his outstanding performance. Also speaking, PDP National Vice Chairman, South-South, Elder Emma Ogidi urged all the liaison officers to be loyal to the Rivers State governor and the PDP. Responding on behalf of the liaison officers, Gideon Demua of Tai Local Government Area assured the governor that they would put in their best to promote good governance, and pledged 100 per cent loyalty to Wike and the PDP at all times.